Why did you become a peer mentor? I became a mentor because I didn’t have one, and wish I did when I was first injured. I truly see the value and benefits of mentorship for survivors. As a mentor, I want to share with others that the stars are the limit to life’s passions and discoveries. 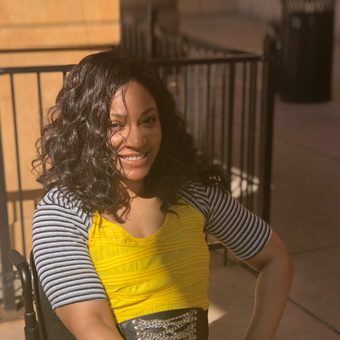 I've learned a lot about parenting with an injury, adaptive sports, going back to school, wellness and driving, as I kept my passion for the arts and fashion alive. One must know that support is the main ingredient to have during this new journey of life. What is the cause of your paralysis? If you have a spinal cord injury, at what level (for example, C5, T9) is your injury? Do you use a manual wheelchair, power wheelchair, walker and/or cane? If you are the family member of someone living with paralysis, what is your relationship to him/her (parent, spouse, etc. )?